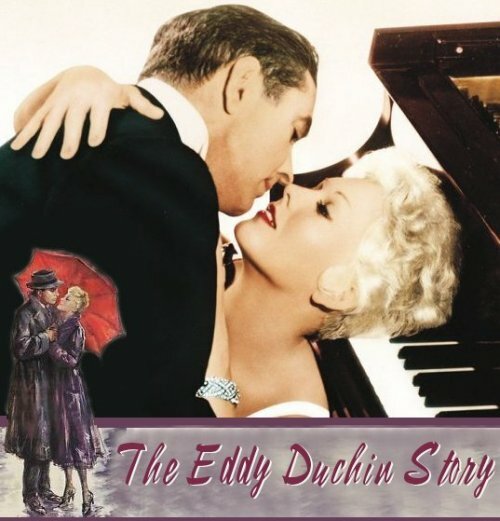 Some of the most memorable tunes in the history of popular music, captivating rhythms that never seem to lose their appeal are heard in Columbia Pictures’ “The Eddy Duchin Story”, which stars Tyrone Power and Kim Novak. Power, who appears in the title role, simulates the famed pianist’s style at the keyboard in perfect synchronization to the playing of Carmen Cavallaro, who recorded the music for the film. Most of the numbers played in the film are tunes identified with the beloved pianist, each rendered in what is known as “the Duchin manner,” an individual and distinctive treatment of the music easily recognized by his many admirers. Also heard in “The Eddy Duchin Story” is a brilliant arrangement of “Chopsticks,” with Power as Duchin playing the simple melody in a duet with a four-year-old, gum chewing Chinese boy. The scene is considered one of the most delightful in the picture, contrasting sharply with its locale, the debris of a war-destroyed Pacific island home during World War II when Duchin himself served as a Naval line officer. “To Love Again,” a hit tune especially written for the film, is considered by those who worked on the film and who knew the popular pianist as a song which probably would have ranked high in the radio and recording artist’s repertoire. It serves as something of a theme for the picture, which covers Duchin’s climb to fame, his marriage to a beautiful New York socialite, the tragedy that struck them and his ultimate triumph over dispair. “To Love Again” was written by Ned Washington, Morris Stoloff, and George Sidney. Often, when a star is particularly fond of her wardrobe in a film, she will purchase two or three of the costumes from the studio for her personal use. One lovely star who recently took advantage of this opportunity was Kim Novak, who stars with Tyrone Power in Columbia Pictures' "The Eddy Duchin Story,". The unusual feature of the arrangement was that the gowns Kim wanted had been designed by Jean Louis in the style of the early 1920's but, according to Kim, "The styles are so similar that, with a tuck or two, my whole wardrobe in the picture could go any place today." The beautiful star bought a stunning negligee of eggshell with a peignor to match, and a black broadcloth suit trimmed in white mink. Tyrone Power, who stars with Kim Novak in Columbia Pictures’ “The Eddy Duchin Story”, made his debut as a popular pianist at the Waldorf-Astoria’s celebrated Starlight Roof. He had an audience that normally would outrage the management of the exclusive New York spot, a motley audience of men attired in slacks, tweeds, and tieless shirts. It was, however, an auspicious debut for Power, who, backed by an orchestra of 26 pieces under Nat Brandywynne’s direction, played the Duchin arrangement of “Brazil.” Power’s debut “performance” occurred during a rehearsal for the actual scene, which involved camera angles, color and lighting effects and sundry other technical skills. As the popular piano stylist, Power displayed in this number the end result of three months of practice under the guidance of Brandywynne, who had worked intimately with Duchin. Diligently, Power had mastered the musical idiosyncrasies and mannerisms of Duchin - the left arm conducted with palm extended upward, the cross hand movement with single finger, with melody in the bass. At the conclusion of Power’s “Brazil,” the audience of musicians and movie technicians burst into spontaneous applause. When the scene actually was shot, with Power playing to a black-tie audience, the sound track carried the piano recording of Carmen Cavallaro who plays all the music in the film. The film was written by Samuel Taylor from a story by Leo Katcher. Jerry Wald produced it with Jonie Taps as associate producers. George Sidney directed. 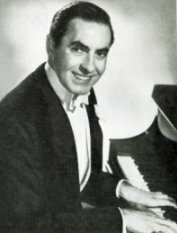 Nat Brandywynne is the noted orchestra leader-pianist of New York’s Waldorf-Astoria, who coached Tyrone Power at the keyboard for Power’s title role in Columbia Pictures’ “The Eddy Duchin Story.” He also is seen as the pianist who played opposite Duchin for many years and served as his relief. What can a man do with seven pianos? When Tyrone Power recently had that many, he used them to practice on. In fact, for months, a piano was a “must” wherever Power might find himself with a spare moment. 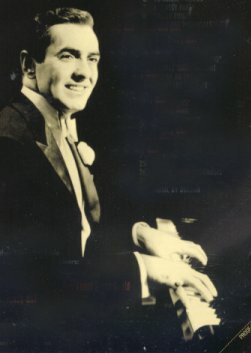 Power needed the pianos to rehearse his title role as the great piano stylist in Columbia Pictures’ “The Eddy Duchin Story,” also starring Kim Novak. “To Love Again,” “Manhattan,” “It Must Be True,” “I Can’t Give You Anything But Love, Baby,” “Dizzy Fingers,” “Exactly Like You,” “Sunny Side of the Street,” “Shine,” “Smiles,” “Will You Love Me in December As You Did in May?” “Shine On Harvest Moon,” “Body and Soul,” “You’re My Everything,” “La Vie En Rose,” “I’ll Take Romance,” “Let’s Fall in Love,” “Whispering,” “Brazil,” “Chopsticks,” and two classical numbers, Liszt’s “2nd Hungarian Rhapsody,” and Chopin’s “E Flat Nocturne”. “The Eddy Duchin Story” costars Rex Thompson and James Whitmore, features Sheppherd Strudwick and introduces Australian-born Victoria Shaw. The screenplay by Samuel Taylor was from the story by Leo Katcher. Produced by Jerry Wald, with Jonie Taps as associate producer, the film was directed by George Sidney for Columbia Pictures.